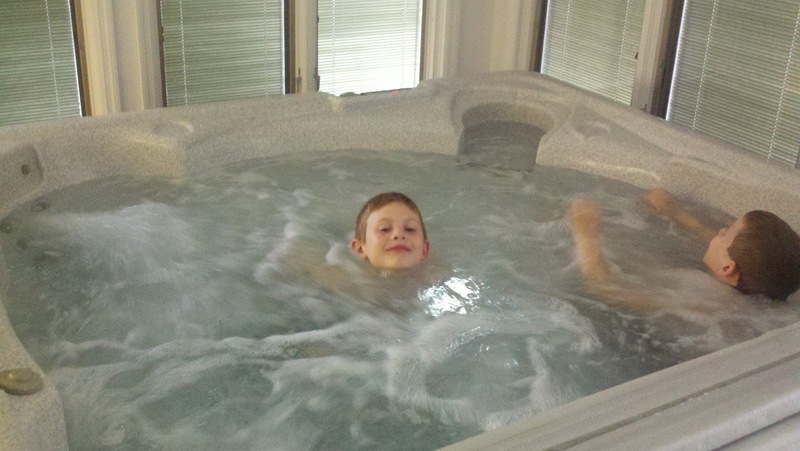 The boys were so excited when we moved into a house with a hot tub earlier this year. Little did they know that their dad wasn't planning on letting them in it....ever. 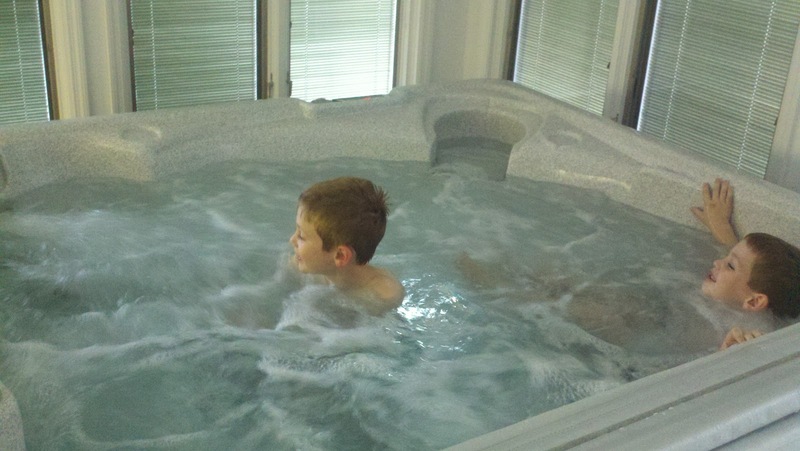 He was just too scared about two little boys peeing in the hot tub that he couldn't even discuss a compromise. I explained the issue to the boys who both thought their dad was nuts, WHY would they pee in the tub????? 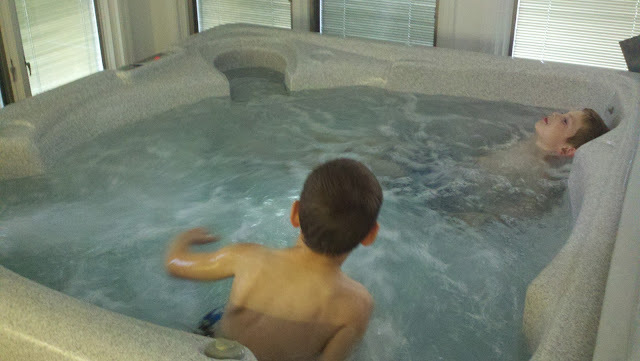 I also told Brian that my plan was to let them in the hot tub (on low heat, don't worry, I don't want to cook my kids!) right before we needed to change the water each time. At least until their older and he's a little less afraid of what they might do in the water. That time is finally here! Both boys were in full meltdown mode on Sunday evening when I sent them both to their rooms. They thought I was nuts when I told them they could come out when they were ready to apologize, but that they also needed to put their swimming suits on. The both kept asking if they should leave their shirts and shoes on because they thought we were going somewhere. When I told them just their swimming suits I couldn't believe they hadn't figured it out yet. They thought I was nuts. WHAT does mom have planned now???? They quickly settled in though! You can have fun again in 4 months boys. Unless your dad decides you won't pee in the hot tub! 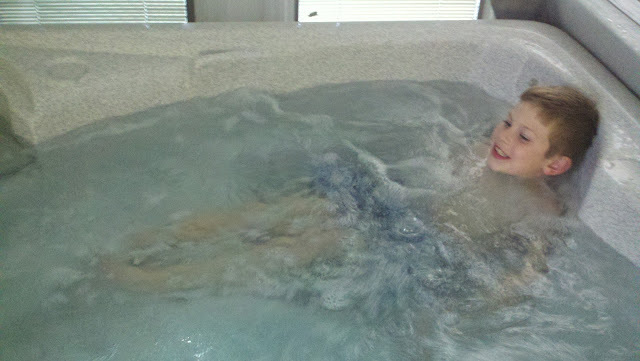 I wish we had a hot tub SOOOOO bad!! It is a MUST in our next house!!! I think I would use it ALL the time.